“Jambo” is a Swahili word meaning “hello”. Did you know that Swahili is a language spoken in the Democratic Republic of Congo (DRC) as well as in other African countries such as Kenya, Tanzania, Burundi, Rwanda? 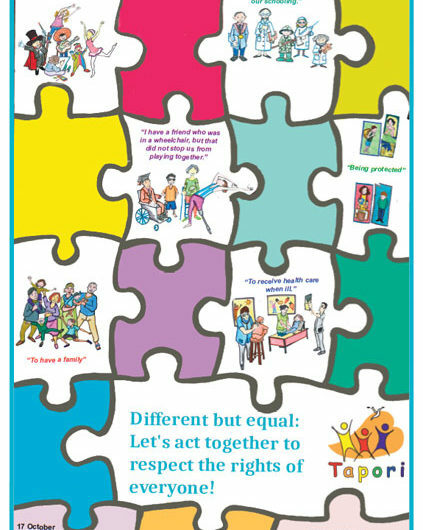 This Tapori Newsletter, October-December 2018, features activities around the World Day for Overcoming Extreme Poverty and on the Rights of the Child. You will also discover our friends from Dole (France) who share with us the collage of “the thousand faces of the Mesnils Pasteur district” and our Tapori friends from the DRC who have demonstrated against violence against children.